Nestled on the beach, this Guraidhoo bed & breakfast is 0.1 mi (0.2 km) from Kandooma Beach and 0.2 mi (0.3 km) from Biyadoo Beach. 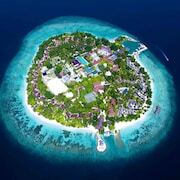 Situated near the beach in Thimarafushi, this bed & breakfast is in the same region as Island Port. Helpful staff and clean room. There was just one issue that toilet small shower was leaking water. So bath mat was fully wet. Situated in Hulhumalé, this bed & breakfast is within a 10-minute walk of Hulhumalé Central Park and Hulhumale Beach. Kurumba Beach is 2.4 mi (3.9 km) away. Excellent staff, could not be more helpful and friendly Nice and clean and well maintained. DONT STAY HERE, CHECKED OUT EARLIER AND NOW STAYING SOMEWHERE ELES WORSE SERVICE EVER! amazing experience. perfect getaway. very friendly and hospitable owners who ensured a homely atmosphere. perfect location. beach within walking distance. would love to come back soon. Front staff was very welcoming. Room was as described, although drainage in bathroom was not working properly. The included breakfast was sufficient. Property was close to the airport ferry terminal. Situated near the beach, this bed & breakfast is within a 15-minute walk of Maafushi Reef, Maafushi Harbor and Maafushi Mosque.